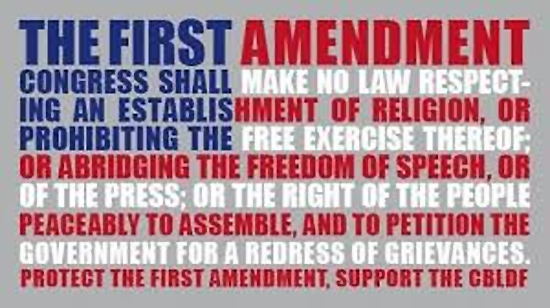 While relatively short on paper, the 1st Amendment was a revolutionary concept at the time that it was written. It represents the first time that a government imposed upon itself a legally binding restriction against interfering with the religious, ideological, or opinionated expression of its population; additionally, it guarantees the freedom of the press and the right of the American population to organize and petition their government for redress of grievances. The protections of the 1st Amendment are vital to the entire ideal of American values—without the freedom of speech, the separation of church and state, the free press, and the right to protest, America simply no longer resembles our ideal of the nation. Speech isn’t Speech, but Money is? Starting in the 1970s, several Supreme Court cases have defined money as speech, thus allowing wealthy interests to make their “voices” known while drowning out those who don’t have any money. Conversely, political protest has been constrained, persecuted, and restricted when it involves actual speech instead of political donations and advertising campaigns. Political protesters who fight against corporate interests and the political power elite (ex. Occupy, anti-war groups, libertarians, etc.) 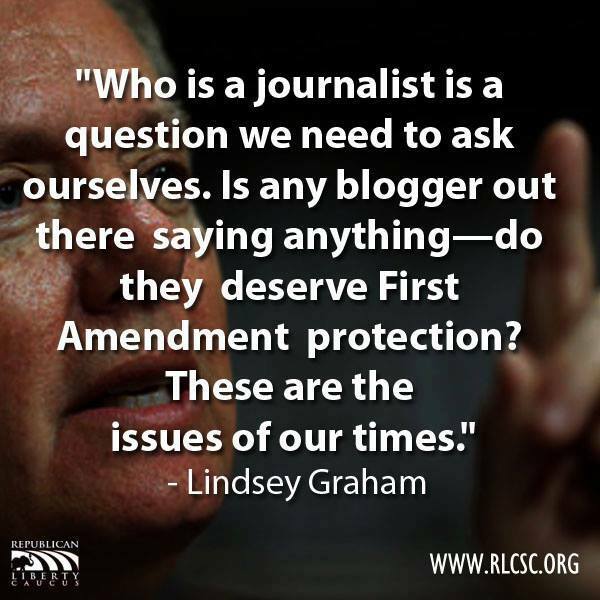 have found themselves assaulted by those in power in ways that should be prevented by the 1st Amendment. Protests at political conventions have been limited to “free speech zones,” often located in fenced in enclosures away from the event and the eyes of the media—this has happened with gatherings of both parties. 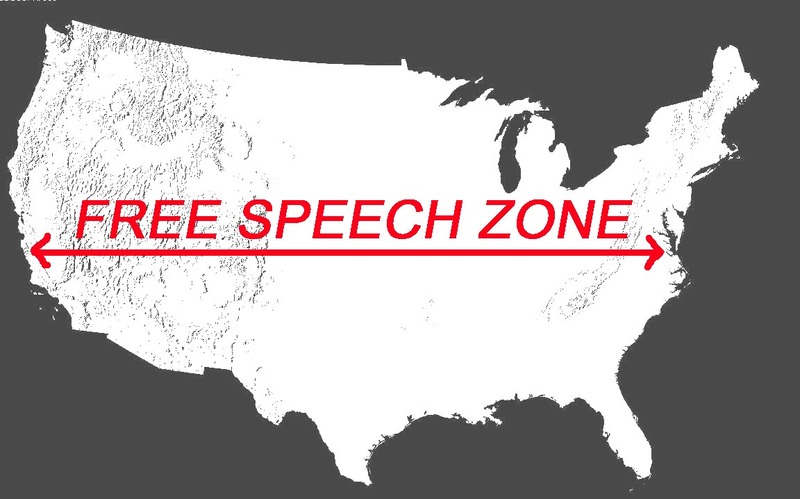 These “free speech zones” defeat the entire purpose of the 1st Amendment by restricting the ability of those who wish to protest their government by cordoning them off into an easily ignored enclosure. 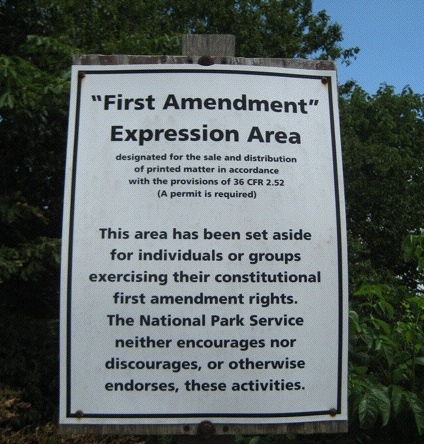 Here is a sign declaring a “First Amendment Expression Area,” from the protests over the park closures during the recent government shutdown. 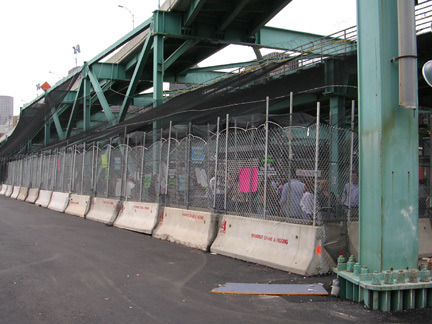 …and this is a “free speech zone” several blocks from the 2004 DNC convention. Protests that are not contained to “free speech zones” have been assaulted by police and spied upon by federal authorities. For example: the “Occupy” movement faced a coordinated series of police raids, massive and illegal campaigns of arrests (to get people off of the street and intimidate others), police brutality, and invasions of their digital information. Their attempts to protest were met with state violence, supported by corporate entities (the NY fusion centers hosted bank security, homeland security, and the NYPD). Just recently, we have seen a perfect example of this repression in Ferguson, Missouri. Police have fired tear gas, rubber bullets, and bean bag rounds at protesters, oftentimes without provocation (there have been some cases where protesters have first thrown bottles and rocks), for gathering to demand the redress of grievance from their public officials. In several instances, police officers have threatened to kill protesters, and, when asked for their identification, have refused to give it. Additionally, the police in Ferguson have imposed the rule that protesters must constantly keep walking during their protests, or face arrest—this is simply arbitrary and a complete violation of the spirit of the 1st Amendment. While protests have been restricted and assaulted, the ability of big-money interests to “speak” via their money has expanded explosively. In the post-Citizens United campaign landscape, massive advertising campaigns have risen up to indoctrinate the American people and support politicians who play ball with those who have money. Put simply, the right to free speech is rapidly turning into the right for those with money to donate as much as they want to campaigns, while those who lack money are left to futilely protest in detached enclosures or face massive police repression. This transformation represents the worst fear of the founding fathers, as it heralds the creation of an American nobility who control the nation over the protests of the population at large. While the United States still claims to support a free press, recent events have thrown this assertion into question. When reporters like Glenn Greenwald and Julian Assange have broken stories that deeply embarrass the American government, they have been tarred as traitors, terrorist sympathizers, and even criminals. Just recently, the legislature has even attempted to redefine the definition of “journalist” so that it only includes people who work for an official press outlet (I.E. not bloggers or independent writers like myself). Ironically, Jefferson, the founding father who helped write the 1st Amendment, wouldn’t have been protected by this reading of the law when he wrote his essays. In some cases, American leaders have even attempted to argue that publishing information that could be used by terrorists for informational or PR purposes (anything that makes the US government look bad or exposes how we have violated peoples’ privacy) is tantamount to supporting terrorism in a legal sense. This allows them to justify turning the massively powerful eyes of the American security apparatus on the journalists, violating the reporters’ privacy rights and intimidating all but the most brave. To quantify the attacks on the media by the US government in recent years, we need only look at the press freedom rankings by the non-profit group Reporters Without Borders. 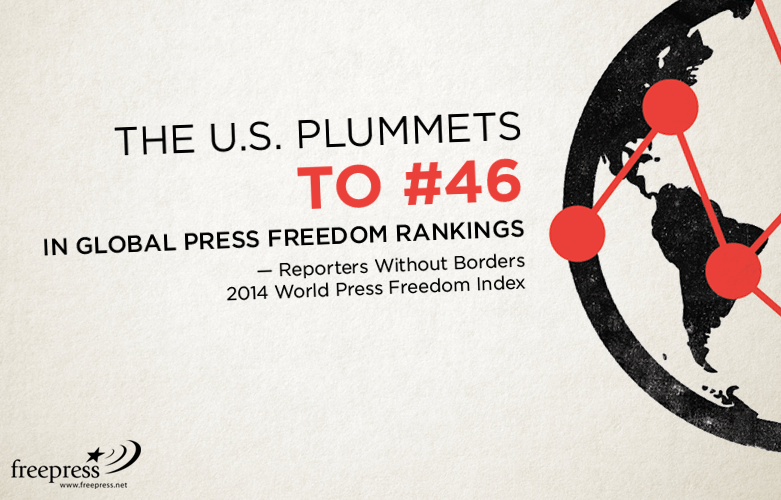 According to their 2014 report, the United States ranks number 46 in international press freedom rankings, down from a ranking of 33 in 2012 and 20 in 2010. At this point in America, the media is sharply divided into “mainstream” outlets that have incredible access and fraternization with those in power, thus tend to support the establishments, and the “outside” media outlets who risk official persecution for telling the truths that those in power would rather cover up. The persecution of these outside outlets is not yet to the point where the US media is repressed like in China or Russia, but we have taken several very worrying steps down the dangerous road that leads in that direction. The 1st Amendment is largely meaningless if the practical application of the law allows those in power to repress free speech, crush dissent, and intimidate the media—unless it is applied, the 1st Amendment is simply a couple dozen words on a page. In order to prevent the United States from continuing to disregard the 1st Amendment, the American public must get active. We must push for a Constitutional amendment banning money in politics (go to Wolf-PAC.com for more information on that front), while holding any politician who infringes upon the 1st Amendment accountable at the ballot booth—this includes politicians at all levels of government, from the local sheriff to the president, and in both political parties. I have no doubt that this campaign to restore the 1st Amendment will be long, exhausting and difficult, the costs of not acting are far too high to contemplate in the long run. it seems the majority of people will have to feel the desperation of what the removal of these and other rights will feel like, before Americans en masse will have the fighting will to stand up. I have reblogged to my person FB page, thank you.